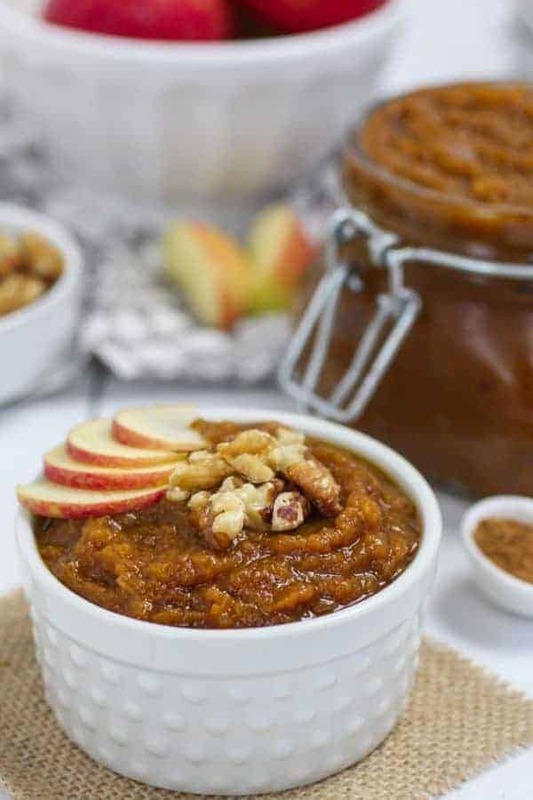 When life gives you apples, make this Slow-Cooker Pumpkin Applesauce. Tis’ the season for slow-cooker EVERYTHING! 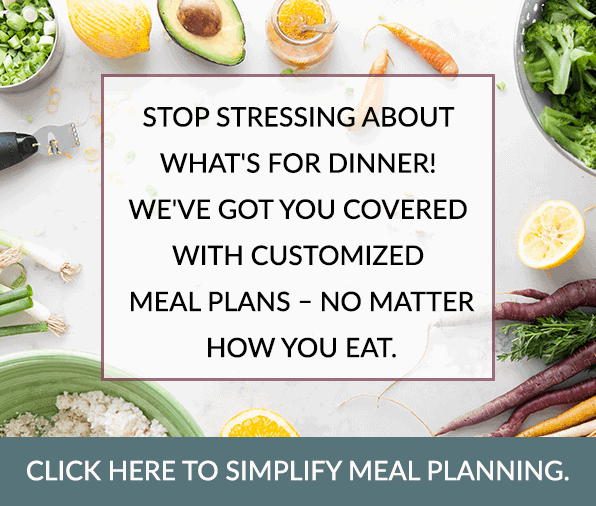 If you’ve been following our blog for awhile now, you may have caught on that slow-cooker recipes are kind of our thing. 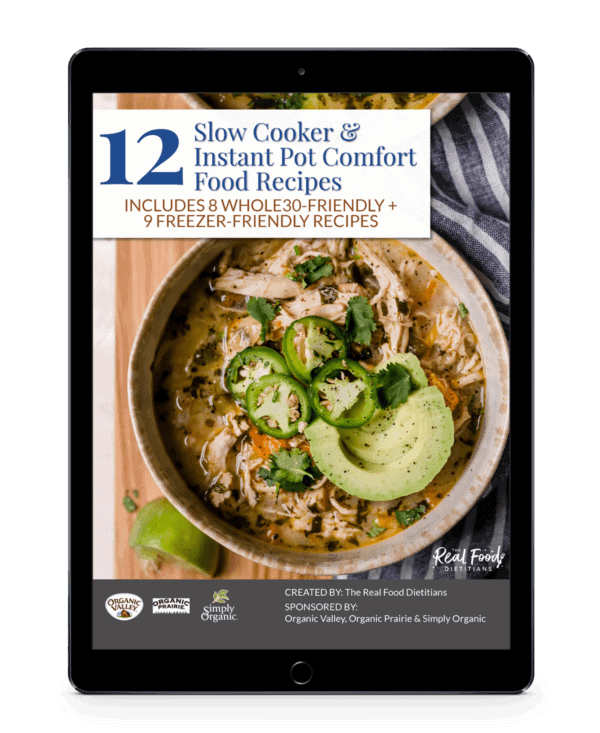 We love the simplicity and ease of slow-cooker recipes and the leftovers that can be enjoyed for days to come. Today, I’m going beyond the usual hearty slow-cooker entree recipe and sharing with you a recipe that I make every Fall. 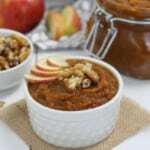 This Slow-Cooker Pumpkin Applesauce is a tasty way to use up the over-abundant amount of apples that you might have on hand this time of year. Especially if you’ve made a recent visit to a local apple orchard or have an apple tree right in your backyard. Not only will you love the flavors of Fall that comes with this pumpkin apple duo but also the aroma it will fill your home with as it simmers away in your slow-cooker. This year, I changed the recipe up a bit and added a little something extra. An ingredient that adds a nice boost of nutrition and quality protein. Can you guess what it is?! Collagen! 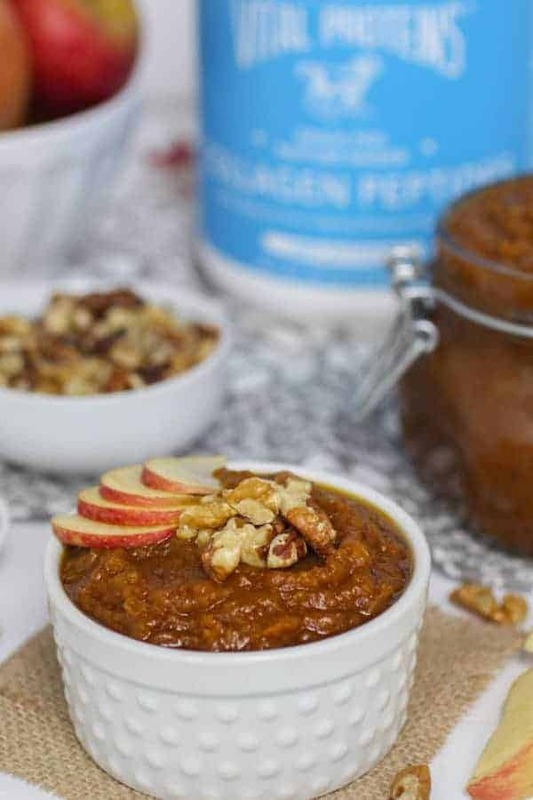 The addition of vital protein collagen peptides adds quality protein and a boost of nutritious benefit to this Slow-Cooker Pumpkin Applesauce. Like slow-cooker recipes, you may have also caught on that we’re quite religious with our daily collagen intake. Collagen is the most abundant protein in the body. As we age, the production of collagen within our body slows down. 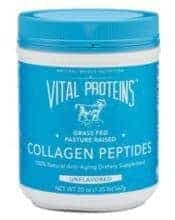 This is why supplementing with a good quality collagen peptide, like Vital Proteins, is a good idea. 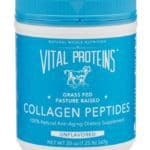 Collagen is key protein in maintaining healthy joints, bones, skin, hair and nails. You can read more on the great benefits of collagen in our post called 5 ways collagen can improve your health. In this recipe, I used collagen peptides which are highly bio-available, digestible and soluble in cold or hot liquids. Because they are soluble in hot liquids, you can add the collagen right along with the apples, pumpkin and spices. 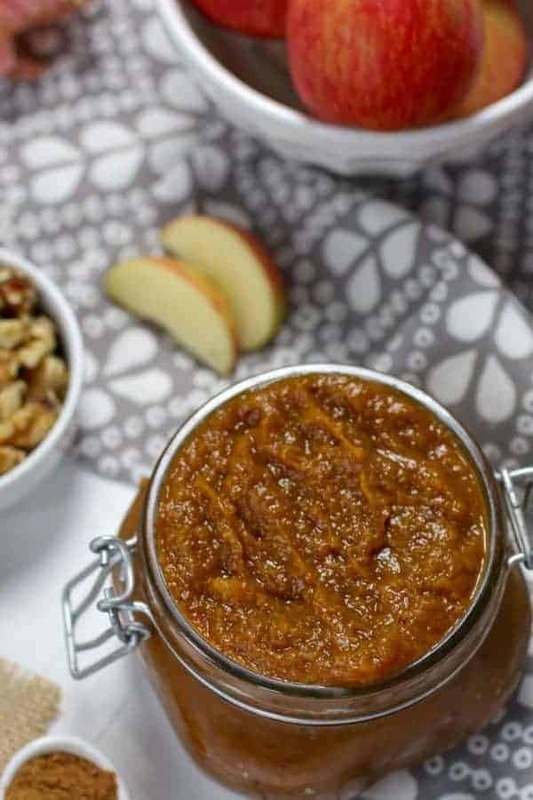 Serve Slow-Cooker Pumpkin Applesauce on-top of plain, whole milk yogurt and sprinkle with a few walnuts for tasty and satisfying breakfast or afternoon snack. 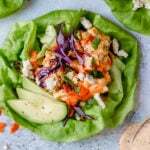 While the collagen adds a nice boost of protein to this recipe, we’re stilling missing out on one key macro-nutrient. We’re missing fat!! 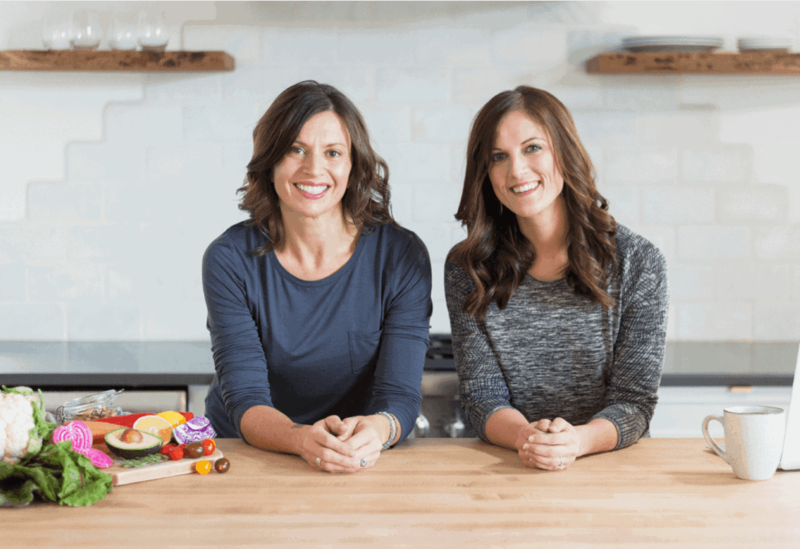 This recipe is “fat-free” – a common diet buzzword that we don’t use too often on our blog and even cringe a little when we hear it. 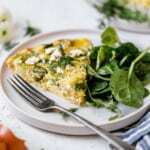 However, it just so happens that this recipe does not call for any ingredients that contain fat but we all know that balancing carbohydrates, proteins and fats is key in creating a wholesome, nutritious and satisfying meal or snack. Exactly why we recommend serving it with a healthy fat source such as whole milk yogurt and walnuts or a splash of heavy cream! And it makes it that much more delicious. If you follow a dairy-free diet, feel free to use an almond milk yogurt (such as Kite Hill), chia-pudding or coconut milk. And if you’re on a Whole30 we recommend serving it with a side of you’re favorite Whole30-friendly sausage. 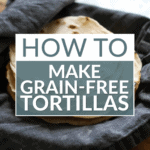 This recipe can be stored in the refrigerator for up to 10 days and is also freezer-friendly. Are you ready to fill your home with a mouth-watering aroma and make this Slow-Cooker Pumpkin Applesauce to enjoy for the days to come?! 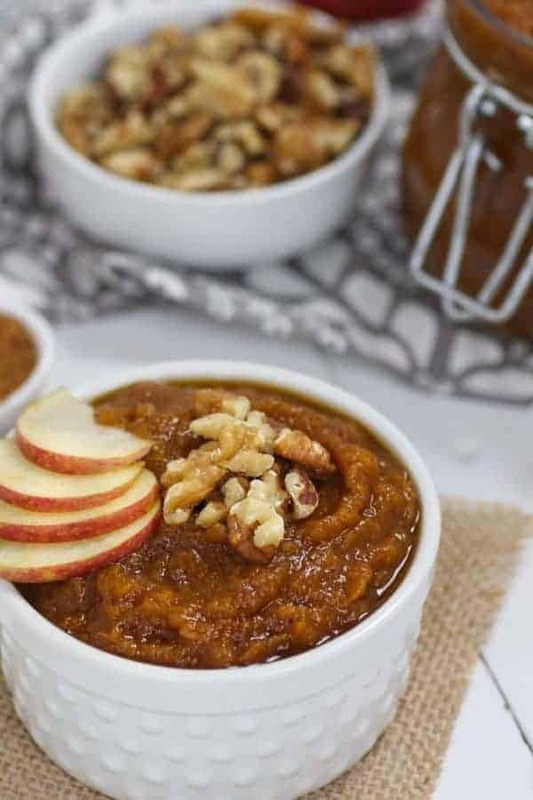 This Slow-Cooker Pumpkin Applesauce not only makes for the most delicious breakfast or snack when served with yogurt but it will also fill your home with a beautiful, flavors of Fall aroma. It’s made with collagen peptides which adds a nice boost of nutrition and quality protein that nourishes the body with anti-aging benefits. Optional toppings: chopped walnuts, pecans, coconut flakes, etc. Peel and cube apples, place in slow cooker. Turn slow cooker to low and cook for 4-6 hours or until apples are cooked through and can easily be mashed. For chunkier applesauce, mash with large spoon or potato masher. For a smoother applesauce, transfer to a food processor (blender works too) and process until desired consistency. Enjoy plain or mix into your favorite yogurt. 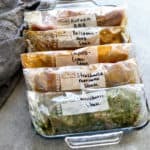 Store in refrigerator for up to 10 days or freeze. Comment below and let us know if you give this recipe a try. This is such a wonderful idea, pumpkin and apples are so good together! Love the addition of the collagen! 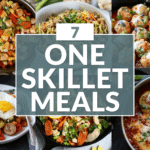 I LOVE this recipe–it’s great either hot or cold and it’s incredibly easy. Thanks so much! Thanks Bethany for the feedback! So glad to hear you enjoyed this recipe. It’s one of my faves! 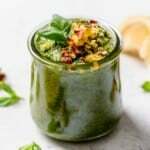 Hi there, can this recipe be made without the collagen? It sure can be. The collagen doesn’t add anything structurally to the recipe, it just adds protein and amino acids. How much time on the stove or oven would you recommend to people who don’t have a slow cooker? I would simmer the apple and pumpkin mixture for 30-40 minutes on the stovetop, stirring occasionally to prevent it from burning and to check that the consistency is what you desire. Just a friendly FYI. Vanilla extract isn’t Whole30 compliant. But! You can use vanilla bean powder. ???? Hi Kendra! Thanks for the catch. We’ll make a note of that in the recipe. Can fresh pumpkin be used instead of canned puree? Thanks!